Time to blend some of the data dweebiness you’ve been reading in the first two installments in this series with some of the philosophy dweebiness that can be blamed directly on my One Year BA. In this case, the fusion between these two worlds derived from having been reminded of the relevance of a particular philosopher – Martin Heidegger – not once, but twice during the week the HarvardX research findings under discussion were made public. In the first instance, a fellow ChinaXer reached out after reading a comment I made about “independent learners studying in their pajamas” to send me a picture of the PJs he was wearing (which, coincidentally, are similar to the ones I’m clad in right now) and to share his experience as a student who studied under a professor who had been “in dialog” with Heidegger (thus establishing a connection to what has come to be called “The Tradition” in philosophy). In the second instance, after a talk about how Artificial Intelligence (AI) might help in the analysis of MOOC-related data (particularly real-language submissions from students in course review surveys and comment forums), I recalled this article written by Professor Hubert Dreyfus, the Heidegger scholar whose understanding of what that philosopher was saying in the 1920s meant doom for first-generation AI. For unbeknownst to the brilliant scientists who were trying to build computer systems that could replicate the workings of the human brain, their project was built on a centuries-long philosophical tradition of rationalism, one which said that the mind worked by applying rules (in the brain’s case, mental rules) to data (in the human case, sense data). So if that was how human beings operated, then it was just a matter of attaching the right probes and censors to a sufficiently powerful computer programmed with rules (algorithms) that could turn that data into the knowledge needed to inform decisions. And even if such systems were not sufficiently powerful in the 1960s when first-generation AI was hot, it was just a matter of time before processor speed and the sophistication of programming languages made computers indistinguishable from human thinkers a reality. Madness! delared Dreyfus who pointed out that, according to Heidegger, even something as simple as hammering a nail was too complicated to be broken down into rules applied to data. For even if one has to make numerous mental calculations regarding time, space, force etc. to drive a nail into a plank the first time or the first hundred times, after a thousand such nailings the ability to hammer becomes “ready-to-hand,” (i.e., built into a body working without input from the calculating mind). And hammers do not exist in isolation but are meaningless separate from nails, wood and other equipment, as well as from the situations in which hammering occurs. For if an outdoor carpentry job gets cancelled because of snow, this does not represent just one more rule that needs to be worked into the virtual world of a computer trying to replicate human thought, but a whole new world (or “frame”) that needs to replace the previous one. This “Frames Problem” was identified as an insurmountable barrier to “true” AI, although as Dreyfus pointed out subsequent attempts to create a “Heideggerian” AI have still not understood that seemingly mental process may in fact be bodily ones. For example, does a animal positioning itself to bring another animal into visual focus do so based on mental rules designed to gather the data needed to trigger a fight or flight instinct, or does motion contributing to vision represent an attempt to create a bodily equilibrium? Think about that the next time your spouse changes the orientation and magnification settings on your car’s GPS, something that (for me at least) triggers not a mental but a visceral response. Dragging the discussion back to MOOCs (or specifically what the data released by Harvard and MIT last week has to say about MOOC students), we need to be humble about drawing conclusions not only because we are just at the beginning of data collection and analysis but because data (no matter how “Big”) and analysis (no matter how sophisticated) cannot encapsulate even a fraction of the human experience behind every dot on every “use case” chart. For example, I know exactly where to place myself on this chart that maps usage against grades for the HarvardX class The Ancient Greek Hero (having completed the course I’d be on the far right, and my dot would appear at .82 on the y-axis, corresponding to my final grade of 82%). Now that location is not meaningless. But does it take into account the fact that I got so absorbed in the material that I read The Odyssey in the men’s room of a Valvoline while my car was being serviced? And does it take into account the fact that, despite everything we “know” about the distance between teachers and students in huge MOOC classes, I found a way to build a personal connection to the teaching team behind Greek Hero (by interviewing them for this podcast, and staying in touch since). And while it would be easy to point out that mine is a special case, that’s exactly the point. For my special case is not more (or less) special that that of that former philosophy student taking ChinaX while sending me a photo of his pajamas, or from the Mongolian student who used MITx’s Circuits and Electronics MOOC to anchor his successful application to the Massachusetts Institute of Technology, or to any of you reading this who – by dint of being human – makes you a combination of facts, rules, emotions, instincts, experiences (including learning experiences – MOOC or otherwise) that cannot be boiled down to inputs, algorithms and data points. 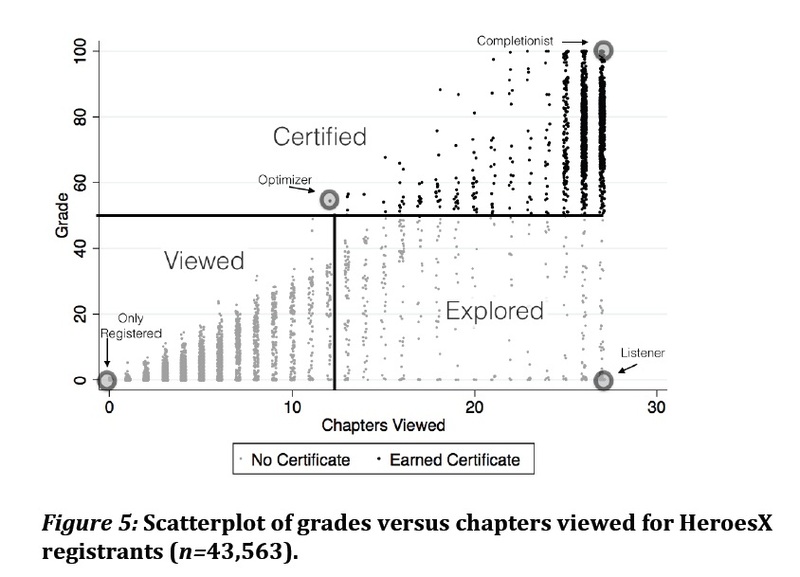 So even as those of us who are involved with MOOCs (including me) use the data coming online to draw conclusions about groups of students (such as 18-22 year old traditional college learners, older students or students working in non-traditional learning environments), we need to keep in mind that we’re just making informed guesses that must forever underestimate the complexity of the individuals and their respective, ever-changing worlds that make up the “reality” we are trying to get our hands around. Im working on this project on MOOC and I found your article extremely interesting and helpful! Is there any source online where I can get hold of quantitative data related to mooc ? ?